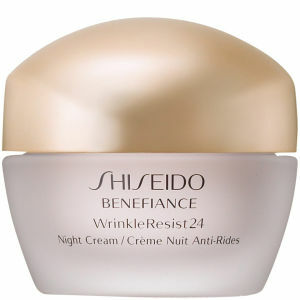 Shiseido Benefiance WrinkleResist24 Night Cream will intensively nourish your skin overnight, as well as targeting the visible signs of ageing. Formulated with mukurossi extract, which inhibits the activity of a wrinkle-triggering enzyme to make your skin more resistant to the future signs of ageing, the anti-ageing cream also improves the appearance of any existing wrinkles. Ideal for normal to dry skin types, the nourishing night cream will promote a soft and silky skin texture. - L.M.